We were so excited to introduce you to Andra Hall and her new crafty business, Bloomin' Idiot Designs because we love that she initially used her talents to raise a ton of money for the Walk to End Alzheimer’s. 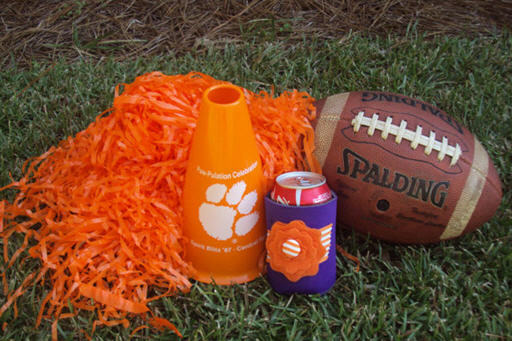 We love her cute headbands, koozies, nametag holders and pins -- all available in Clemson colors of course! And the icing on the cake is all of her items currently in her Etsy store are under $10! These would make fabulous gifts for your Clemson friends and family. 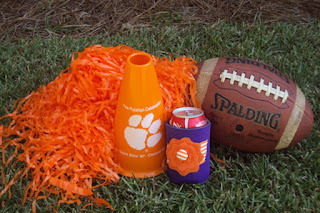 One lucky Clemson Girl reader is going to win four of Bloomin' Idiot Designs handmade Clemson koozies! Congrats Lindsay! Please email us at clemsongirlblog@gmail.com to claim your fabulous prize! Thanks to Bloomin' Idiot Designs for sponsoring today's giveaway. Who's looking forward to a big night game this weekend vs. GT? Will you be in Atlanta at the game?